The rate of workforce drug positivity hit a 14-year high in 2018, according to Quest Diagnostics’ recently released 2019 Drug Testing Index™. Positivity rates in the combined U.S. workforce (general U.S. workforce; federally mandated, safety-sensitive workforce; and combined U.S. workforce, which includes the prior two populations) increased nearly five percent in urine drug tests, climbing to the highest level since 2004, and are now more than 25 percent higher than the 30-year low of 3.5 percent recorded between 2010 and 2012. Marijuana continues to top the list of the most commonly detected illicit substances across all workforce categories and specimen types (urine, oral fluid, and hair), while the positivity rate for opiates in urine testing declined across all opiate categories. Since 2011, the post-accident positivity rate has increased annually, with the general workforce seeing a 9 percent increase between 2017 and 2018, and a 29 percent increase over five years. 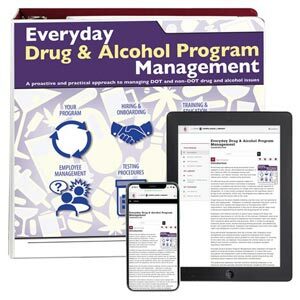 J. J. Keller's Everyday Drug & Alcohol Program Management Manual helps you manage a workplace and/or DOT drug and alcohol test, while complying with state and federal requirements.